If you are renting and considering buying a home, now could be the time to make the move based on recent data. If you’re looking at adding an investment property to your portfolio, this same data could also support that decision. The news, according to CNBC is that the median monthly rent in February rose to $1,472, an increase of 2.4 percent compared with February 2018, according to Zillow. For the typical renter, this means about $400 more per year. 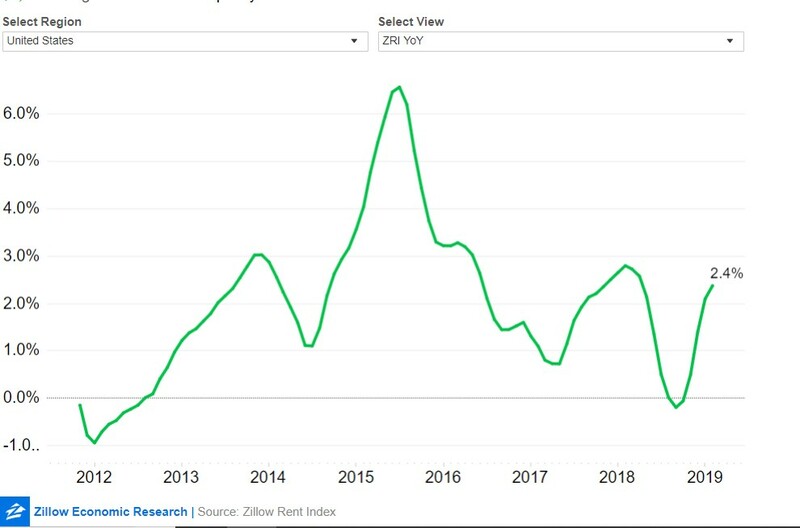 “The rental market spent part of last year catching its breath after several years of breakneck growth,” said Zillow economist Jeff Tucker. “Consistently, apartment occupancy growth has nearly kept pace with supply growth, as demand for apartments has been robust throughout 2018,” noted Barbara Denham, senior economist at Reis, in a December report. Home sales have yet to rebound so far this year, and home prices are still gaining. Mortgage rates, however, dropped at the end of last year and continue to fall this month, signaling potential strength in the spring market. More robust sales could take a little heat out of the rental market, but there is still a very low supply of entry-level homes for sale, meaning some potential first-time buyers will continue to rent, whether they want to or not. According to Zillow, “the priciest major metro in the country remains San Jose, Calif., at $3,547 in February, up 1.4 percent from a year earlier. It’s followed by San Francisco at $3,448 a month (up 1.6 percent), Los Angeles at $2,835 a month (up 3.5 percent), San Diego at $2,643 a month (up 4.2 percent) and New York at $2,419 (up 1.2 percent). Nationally, the trend could be worrying for renters. The recent increases have pushed rental prices to a level that makes rent almost unaffordable for many. This could mean rates of increases will slow in the future and be in line with changes in wages. 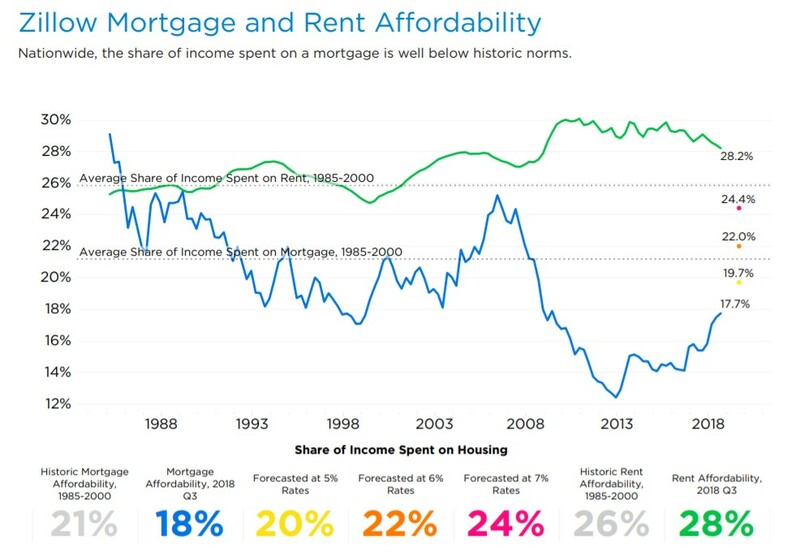 As the chart shows, the average share of income spent on rent, 28.2%, is well above its historic average of about 26%. Wage growth is about 3.4% according to data provided by the Atlanta branch of the Federal Reserve. This could indicate that the average share of income spent on rent could remain relatively elevated as wages increase gradually. MarketWatch cited reason for caution in the real estate market, “Meanwhile, home value appreciation dropped to its lowest rate since December 2017. The median U.S. home value, as measured by Zillow, was $226,300 in February, up 7.2% from the previous year. The cool down in home values was most notable in San Jose, Calif., and San Francisco. That’s down from a 7.8% annual rate of home value appreciation in January. The trend in prices is shown in the next chart. As this chart shows, prices are at new all time highs and the pace of recent gains has been high, but rather steady and not indicative of a bubble as we saw in many markets in the early 2000s. One reason for that could be slower construction activity which is in contrast to the rapid pace of building in the bubble. Analysts note that zoning restrictions and costs of construction could serve to limit new homes for some time. Limited supply could support higher home prices, even if the appreciation in prices falls to levels that are closer to their long term average which is in line with the rate of inflation. The outlook is for slower gains, “U.S. 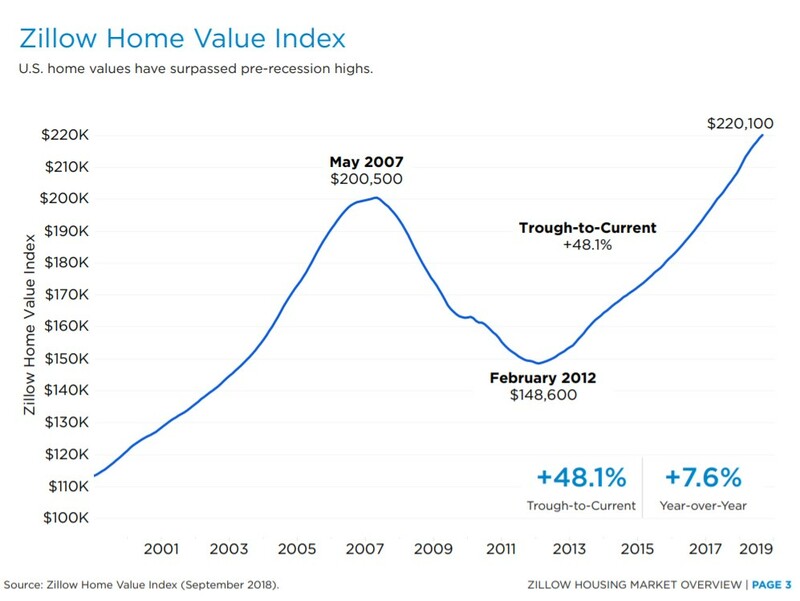 home values are growing at a steady pace, and have surpassed pre-recession highs nationally and in a number of large markets. Driven largely by limited inventory and high demand, home values are growing fastest at the bottom end of the market. Given the trend in prices, now could be an ideal time to consider a home, while rates are low, and prices are on the rise. This could benefit owners who reside in the home who could benefit from appreciation or owners who rent and could benefit from slightly higher rents in the next few years.